This is sort of a non-post post. Whatever that means. I'm such a creature of habit that I always post first thing in the morning (while brushing my teeth, to be precise), but lo and behold, I was in this very position above early this morning, before Steve left for work. Unable to move. Paralyzed by the very tempting fabric and yarn all around me. But trying to focus on the manuscript in front of me that is due (to the post office, at least) with it's very last edits tomorrow - all the small details that I'm not so great at. However, I am great at procrastinating (I'm actually doing it this very moment! Ha! ), even when it's work I'm excited about (um, my book). I'm good at procrastinating in a very over the top, ridiculous kind of way. This weekend was full of giving in to temptations and distractions, and moving around from spot to spot trying to find a place where I could focus (library? nope! too many books! coffee shop? nope! too much sugar! studio? nope! see above! ), and so now here I am at the very last minute, finishing things up late into the night before something is due. Which is how I work best anyway, and should have just planned it this way all along. Yes, indeed. To cement this post in it's randomness, and to continue the procrastination, I bring you this sweet little Miss Independent. 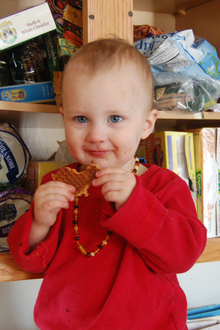 Who apparently loves stroopwafels as much as I do. All was quiet in the kitchen while I was reading to the boys in the living room, which any Mama of three should know means trouble. I walked in to find this scene. My climber. 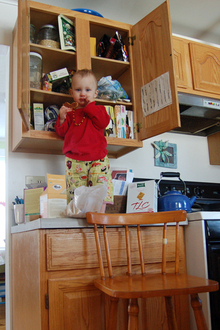 Moving tall stools around, climbing on counters, and digging through the cupboards to find the good stuff. And she got it. Three stroopwafels full of good stuff. Yum. Okay, I really AM going to work now. Really. No, really!